↑ উদাহরণস্বরূপ দেখুন, Biesen (2005), p. 1; Hirsch (2001), p. 9; Lyons (2001), p. 2; Silver and Ward (1992), p. 1; Schatz (1981), p. 112. 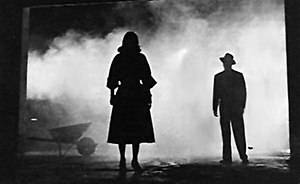 Outside the field of noir scholarship, "dark film" is also offered on occasion; see, e.g., Block, Bruce A., The Visual Story: Seeing the Structure of Film, TV, and New Media (2001), p. 94; Klarer, Mario, An Introduction to Literary Studies (1999), p. 59. ↑ Naremore (2008), pp. 4, 15–16, 18, 41; Ballinger and Graydon (2007), pp. 4–5, 22, 255. ↑ Bould (2005), pp. 24–33.